If you want to make a good "art" investment, you can do a lot worse than buy into film posters. Prices have shot up in the last few years, particularly for vintage titles in (this is the important bit) excellent condition. But you can still pick up a decent title – either on eBay, or if you want to guarantee the quality and the originality, the Film Poster Auction at Christies. There’s one coming up in London (South Kensington) on 29th June, with prices starting from £200. 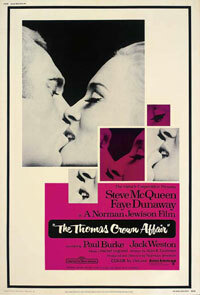 In fact, if you can spare £300, you can pick up this rather cool Thomas Crown Affair poster. Sounds a lot – but it’s an investment, and one unlikely to go down if you look after it.